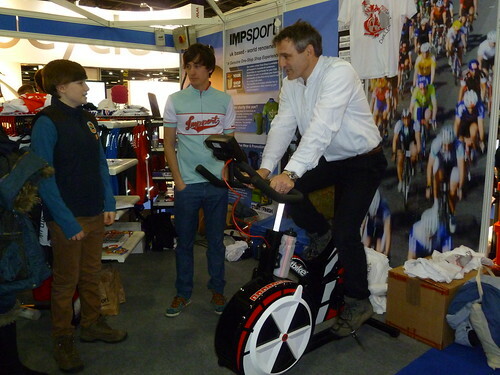 By some strange coincidence our weekend visit to London happened to coincide, once again, with the London Bike Show. With many local roads covered in frozen snow a morning spent wandering round a nice warm hall looking at bikes seemed a very good option! Bikes and tea, what more could you want? I haven't looked at the figures but this year's show seemed bigger than last with many more exhibitors. There was also the usual bike test track, various speakers, and, new for this year, indoor criterium racing. Unfortunately the races were held late in the afternoon and I couldn't stay that long so I just wandered round looking at whatever took my fancy and keeping a keen eye out for any bargains! I really don't need any more cycling kit but you know women and shopping! There didn't seem to be as many freebies as last year although I did manage to acquire several free samples of chain oil and ate more than my fair share of some high tech jelly baby type energy product. That said I prefer the taste of jelly babies and they're a fraction of the price! When I arrived there I had no thought at all that I might need a new helmet but when I saw the 'Reduced from £59.99 to £19.99' sign I soon decided that I did – especially as it has integral flashing gizmos and scope to add even more. Its a Bell Muni reviewed here and I'm rather pleased with it. 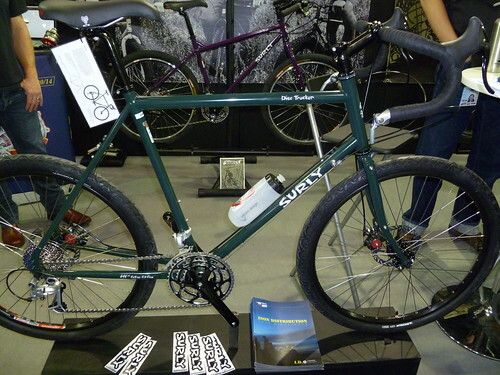 Every time we have a spell of bad weather I decide that I really need a bike with disc brakes and scope for wider tyres so these two from Surly caught my eye. The disc trucker looks a good sturdy machine and the fatty is just ideal for playing in the snow. Not sure what I'd do with it now the snow has melted though! Pinarello are famous for their classy, race winning bikes so what was their designer thinking of when he came up with this? Each to his own I suppose. Talking of strange designs, this one turned a few heads. 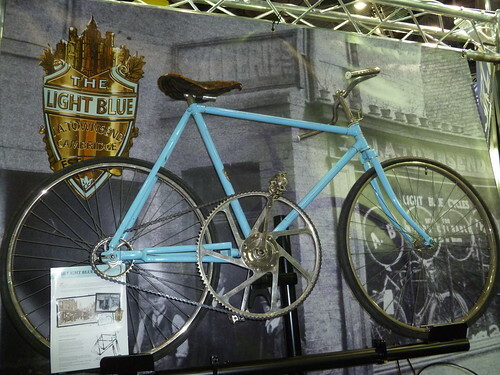 It was built in Cambridge in 1900 with a 100 tooth chainring to celebrate the turn of the century. Apparently it is fairly easy to ride due to the large rear sprocket but its modern reincarnation looks a much better bet to me! 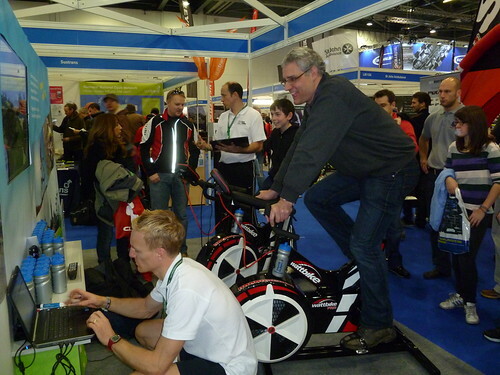 Several stands featured Watt Bikes, some in pairs so people could race against each other, and others singly so you could just see how much power you could produce. I was definitely not interested in trying to race anyone but after I'd walked past the stand several times I started getting curious. Eventually I decided to give it a go. You sat on the bike and pedalled steadily for a few minutes to get the hang of it and then the guy in charge flicked a lever to move it up onto its maximum setting and you pedalled for all you are worth for 30 seconds. It seemed simple enough but I should have known that a 30 second sprint was never going to be my forte. Cav has nothing to fear! I thought I was pedalling at a good lick but I'm afraid I only managed to generate a paltry 465 watts. I did get a T shirt for my efforts but it was miles too big. It was an interesting experience but I don't think I'll try it again! It would be easy to make a full day of this, especially as the ticket also includes the Outdoors Show, the Adventure Travel Show and even the Boat Show but with snow falling I felt that a strategic withdrawal was in order. Pity I couldn't have borrowed that fat bike! Posted by Hilary on January 25th, 2013. The Pinarello is unspeakably vile!! Years ago, long after his retirement, Sean Kelly was a mentor on an Irish team and he saw a power meter on a handlebar. "What's that? ", says he. "A powermeter", says the cyclist. "It measures your output in watts". "Hmm", says Kelly covering his mouth with his hand for a second. "Tell me", said he, "does it measure suffering?" 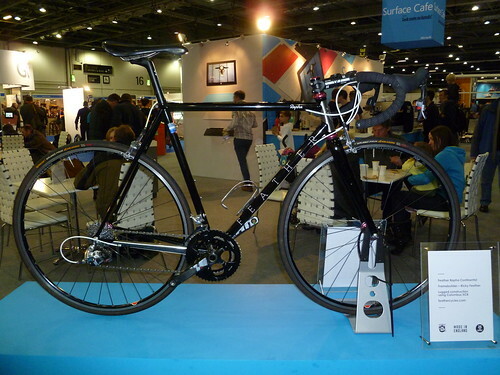 I've also been looking at road bikes with disc brakes. Just looking. I don't like that Feather bike. I read an article in some magazine and I must say it sounded very impressive. 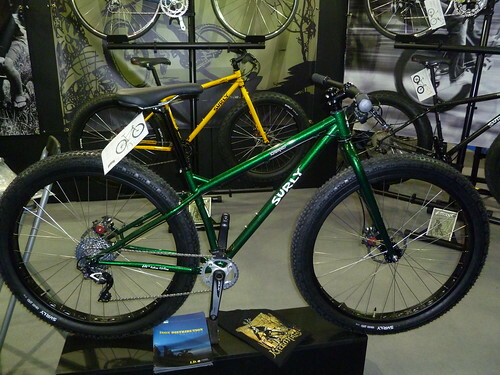 And a mate of mine told me about the bikes the guy makes – he'd seen one hanging up in a shop, I think. But I just don't think that mix of components and frame works. The head tube looks all wrong juxtaposed with the stem and, ugh. I just don't like it. The lettering is done well, though. 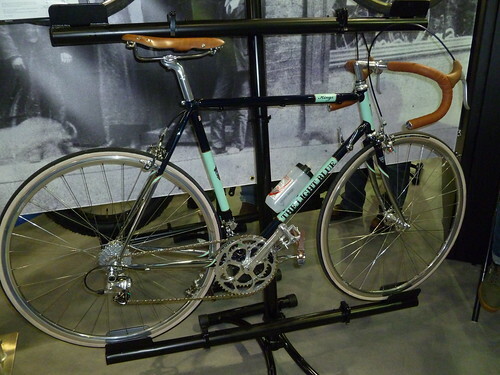 The Pinarello looks like something Billy Connolly might ride on to stage for a laugh. 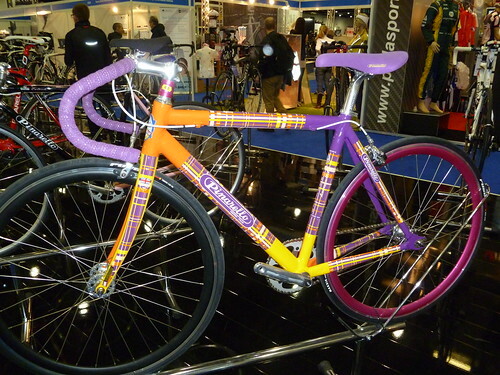 I imagine the same sort of person who buys comedy ties might buy this bike if they have more money than sense. Do you imagine there will be another astonishing coincidence of dates next year, Hilary? Good spot with the Bell helmet. But another one with a peak! Well, I'm not going to be racing against you anytime soon, Hilary. I have never come close to 465 watts of output. Good show, good post. The Pinarello is very classy 😮 . Hilary wrote: Every time we have a spell of bad weather I decide that I really need a bike with disc brakes. Regardless of the weather I will not buy any more bikes that don't have disc brakes (or should that be another bike – I've got no room for any more LOL). Good report Hilary. I have been pondering this for more than a week. I was cowed, Hilary, when I read it. My CompuTrainer displays wattage and I'm lucky if I reach 250 watts. My normal power output is more in the range of 170 watts. Paltry indeed. Wimpish. Why, oh why (said my male self), am I such a wimp? Does this have something to do with the fact that Hilary rides about 9,000 miles a year? Maybe. Apparently 40% of a male's body mass is muscle compared to 28% for females. Hmmmm. Applying a little mental arithmetic with these ratios brought a vision of Hilary's thighs which (thought I) must be ... well toned, perhaps? Then I recalled my son-in-law Andrew, upon whom I subjected Titanium Man last year. Andrew is a serious cyclist and his output was in the order of 200 watts. Okay, now I don't feel so badly. But I still need more justification for my feebleness. The CompuTrainer measures power where the pressure roller presses against the rear tire. Whatever power I'm generating has to be transmitted from the hub through the chain to the rear hub and then the pressure roller. So I can rationalize some power loss there. Also, while the CompuTrainer is mechanical, a lot of its functionality is computationally driven. In other words, my ego is at the mercy of some poor sod's algorithm. So there it is. I'm at peace with myself and my puny 170 watts. And Hilary's thighs have returned to their normal, albeit powerful, 450 watt state. I'm still never racing against you 🙂 . I am very flattered Kern but this was only a 30 second sprint. The young lad before me managed 600 odd and his dad over 1000 so maybe there is some difference in the way these machines measure. The guy running it looked decidedly unimpressed by my effort!